Video game reviewers just can't get enough of this game (with apologies to Zach Braff, the Shins, and Natalie Portman). There's a cheesily awesome scene in "Garden State" in which Natalie Portman hands her headphones to Zach Braff, promising him that the song -- "New Slang" by The Shins -- will "change your life, I swear." The bit is meant to illustrate that head-over-heels sensation great art sometimes induces in us; the experience is so grand, so deeply amazing, our efforts at describing the thing inevitably end up sounding vaguely embarrassing, as if we'd lost all self control. 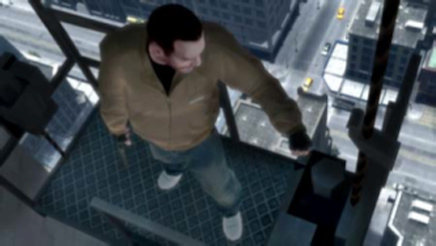 Well to hear reviewers tell it, "Grand Theft Auto IV," the much-anticipated sequel to the intelligent, violent, resplendently liberating, and very popular video game series, is like that Shins song: "GTA IV" will change your life. I now know how film critics felt after screening "The Godfather." It's been days since "Grand Theft Auto IV"'s credits rolled, yet I can't seem to construct a coherent thought without my mind wandering off into a daydream about the game. I just want to drop everything in my life so I can play it again. Experience it again. Live it again. ..."Grand Theft Auto" has matured into something that feels as much like a living, breathing piece of interactive art as it does a video game. We have a hard time imagining anyone picking up this game and not feeling like this is one of the best $60 purchases they've made in a long time. Reviewers were particularly taken by the way "GTA" recreates and pays homage to New York City with its fictional Liberty City. Your nominal task in the game is to push your character through a series of streetwise missions, but really what "GTA" games have always done best is let you do whatever you want -- let you explore (not to mention feel free to harass, carjack, and murder) along an almost unending graphical paradise. Schiesel, piling on the compliments, also calls "GTA" a "richly textured and thoroughly compelling work of cultural satire disguised as fun," and he pedestals its British expat creators alongside "the distinguished cast of Britons from Mick Jagger and Keith Richards through Tina Brown who have flourished by identifying key elements of American culture, repackaging them for mass consumption and selling them back at a markup." Some Characters And Plot Threads Fall Flat: One of the characters, who is intended to have an impact on the later portion of the game, is hard to care about on the level that Rockstar asks of the player. Some of the end-game relationships simply don't carry the same weight of those established in the first half, making it hard to be invested in some of the drama and can ultimately make one of the final chapters feel forced. Some Missions Are Maddening: Of the 155 missions I attempted, 64 ended in failure. That's fine, but some seem impossible on the first attempt and others come close to resulting in thrown controllers. Missions are quick to restart, but by your third or fourth attempt of The Snow Storm, you may be looking for a Rockstar dev online to kill. There's not much in the way of mission filler, but some jobs are definitely more memorable than others. You Belong To The City: The level of detail packed in to every aspect of Liberty City's boroughs is simply astounding. On a micro level, seeing the neighborhood change from industrial to residential, from posh to sketchy, is impressive. Taking a macro perspective of whole islands during a leisurely helicopter flight can be awe-inspiring. I discussed "Grand Theft Auto" in my weekly video for Current TV.